From early afternoon on the days of famous fireworks shows, streams of people in party mood begin trickling into the places, many of whom clothed in yukata (informal cotton kimono) waiting for the shows in lines under the scorching sun. The atmosphere in the crowd will change dramatically when the first of the evening’s fireworks are set off skyward . It is a very exciting and fantastic moment to the spectators. It’s astonishing to think that Japan has about 7,000 fireworks events nationwide every summer. 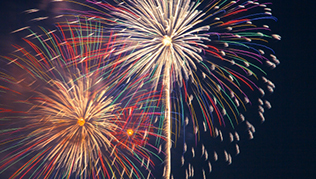 The origin of fireworks is said to be from signal fires in China. The history of fireworks of Japan started in 1549, when guns and gunpowder were introduced by Lusitanians.It was recorded that Tokugawa Ieyasu, the first Shogun of the Edo Government saw fireworks from the Edo castle. 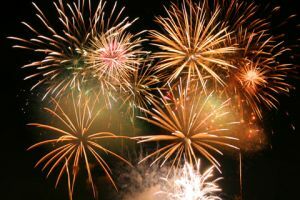 As fireworks manufacturers had improved their skills during the Edo period (1604-1868),　fireworks became summer entertainment for the public by the 18th century. The Sumida River Fireworks Festival, one of the oldest fireworks shows in Japana was set up as annual summer event by the eighth shogun, Tokugwa Yoshimune in 1733. The event was prepared to dispel evil spirits and comfort the souls of the dead ,as the previous year saw epidemics in Edo (current Tokyo) and a nationwide famine which killed about one million people. In the Meiji-period (1868 ～1912), Japanese fireworks makers used imported chemicals for creating fireworks and were constantly improving their technique. As a result, Japanese fireworks became as colorful and sparkling as they are now. With 340-year history, Kagi-ya is the oldest fireworks factory in existence in Japan. Kagi-ya allowed the salesclerk early 19th century to set up his own firework factory called Tama-ya,but Tama-ya was forced to close its business because a big fire destroyed the factory. Even now the onlookers often shout “Tama-ya” as well as “Kagi-ya” in place of applause. Why do the Japanese see and love the fireworks displays ? National love for the events is quite understandable when you consider the character of the Japanese. The mid-summer evening big fireworks shows suit the taste of the Japanese. We cherish short-lived beauty, such as that of cherry blossoms in spring, which are at their best for only a couple of days. The enjoyment of fireworks is along the same line. Jingu Gaien Hanabi Taikai: to be held on the Meijijingu Gaien. If you want to set off Hanabi in your yard, I recommend you to get toy fireworks. Originally they are for children, but you can enjoy them with your family and friends. They can be available easily at a toyshop and a convenient store.